The big box home improvement stores carry two major classes of insulation: fiberglass and rigid foam. Both are designed for residential use. While there is some overlap, each tends to have its own best areas of use. For example, rigid foam is widely considered the "basement wall insulation" because it resists the moisture given off by basement masonry walls. Fiberglass batts, on the other hand, are the "stud cavity insulation," and also the "attic ceiling insulation" because they conform to the many obstructions found in attics. Rigid foam: These are panels of rigid styrofoam, sold in 4-by-8-ft. sheets in a variety of thicknesses from 1/4 to 2 inches. It is also sold in large bundled panels, joined at the ends accordion-style for use as an exterior sheathing material. Styrofoam insulation uses one of one of three materials: high quality, green-friendly polyisocyanurate; extruded polystyrene; or expanded polystyrene. Rigid foam performs well when subjected to moisture, and it does not change dimensions, split, or crack. Wall cavities are often injected with a spray foam insulation, and while this form does dry to a rigid state, it is not considered rigid foam insulation. Fiberglass: Fiberglass insulation consists of tightly packed long rolls or individual batts (single unrolled pieces) of spun fiberglass fibers. In contrast to rigid foam, fiberglass is soft and flexible. The millions of air pockets in fiberglass insulation provide a superior thermal barrier but fiberglass can also trap moisture, leading to mold and mildew growth. Fiberglass should never be used when moisture is even remotely present. Fiberglass insulation is typically sold in batts or rolls that are 15 inches or 23 inches wide to fit standard wall and ceiling cavities with framing members spaced 16 or 24 inches apart, on-center. Thicknesses of the batts range from 3 1/2 to 12 inches. Fiberglass insulation can be sold in rolls ranging from 24 to 32 feet, or in bundled batts, usually about 93 inches long. The rolls or batts may be faced with paper to simplify attachment to framing members. Unfaced batts or rolls are the better choices for laying as an insulating "blanket." Exterior continuous insulation: Rigid foam can be used as sheathing—a continuous layer of insulation on wall exteriors attached prior to the installation of house wrap and siding. Basements: Indoors, rigid foam is the material of choice on walls where the insulation will be touching masonry. Mostly, this means the exterior walls in basement build-outs, except for daylight-facing walls, such as are found in walk-out basements. Rigid foam stands up to moisture better than fiberglass. Radiant heat floors: Rigid foam is used as a thermal barrier underneath radiant floor heating systems. Rim joists: Rim joists around the edge of a foundation can be insulated with rigid foam blocks cut to fill the space and caulked in place. If concrete blocks have open cavities, they should be first stuffed with loosely packed fiberglass insulation. Other uses: Rigid foam can provide soundproofing to interior walls or to sequester interior spaces that are not climate controlled. Exterior walls: Rolled fiberglass insulation's main duty is to fill the cavities of above-grade (non-basement) exterior walls when those walls are accessible from the inside. 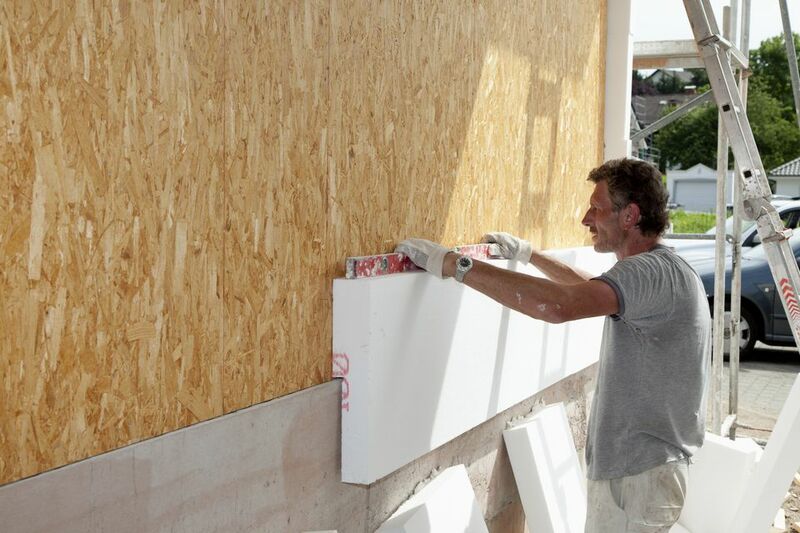 During new construction or major remodeling projects when wall surfaces are not yet installed, faced fiberglass batts are the insulation of choice. On walls with finished surfaces, blow-in cellulose insulation or spray foam is more commonly used to add insulation. Attics: Thick batts or rolls of fiberglass do an outstanding job of preventing heat loss through the ceiling and roof. Faced batts are often installed between joists, or an "attic blanket" of unfaced batts can be laid across the tops of joists. For maximum insulation value, both joist cavity insulation and an attic blanket can be used. Blow-in cellulose insulation is an alternative to fiberglass, and it can also be used to add insulation over the top of fiberglass insulation. Rigid foam is never be used in attics. Floors: Joist cavities above unheated crawlspaces or unheated basements are often insulated with fiberglass batts. Between two- or three-story homes, fiberglass insulation in the floors will deaden sound transmission. Rim joists: The joist spaces above foundations can be filled with loosely packed fiberglass insulation to prevent heat loss. This is sometimes done in conjunction with rigid foam, with fiberglass used to fill the void spaces at the top of concrete block walls, and blocks of rigid foam then used to block off the joist cavities above the foundation walls. Other uses: Loosely packed fiberglass is often used to fill in small gaps around window and door frames, or the spaces where pipes and wires penetrate through exterior walls. Spray foam is also used for this purpose. Insulating properties of various building materials are measured by R-value—a measurement of the thermal resistance of the material. Higher R-values indicate better insulating values. With both rigid foam and fiberglass, the R-values are mostly determined by the thickness of the insulating material. Fiberglass insulation packs in more R-value per cubic inch than does rigid foam insulation. Rigid foam R-values range from R-1 for 1/4-inch thick sheathing panels to R-15 for 3-inch thick panels. R-value is not entirely a function of the thickness of the material, as the facing material and type of foam used will affect the R-value of the material. Fiberglass insulation is less than half the price of rigid foam insulation when calculated by R-value per square foot. For example, insulating a 10-square foot wall area to R-15 costs about $3.40 to $4.00 with fiberglass insulation, while a comparable R-value for rigid foam costs roughly $10.00. There is also less waste with fiberglass insulation. As you cut it to size, rigid foam produces small pieces and thin sections that are virtually unusable. Fiberglass insulation can be torn off and stuffed into small areas, so very little goes to waste. Both products have pros and cons when it comes to installation. Foam's main advantage is that it is a clean, irritant-free product, while the advantage of fiberglass is that it is flexible enough to mold around obstructions. Foam can be cut with a fine saw or sliced and snapped (like drywall) with a utility knife. Foam does not require you to "suit up" and protect yourself against fibers as you do with fiberglass. The rigidity of foam means that it will not accommodate obstructions in the wall, such as wires, outlet, and junction boxes, bracing, etc. The foam must be carefully cut to fit around such obstructions. Because it is difficult to get a tight seal with rigid foam, expandable foam or caulking may be necessary to fill thin gaps between the foam and framing members. Fiberglass is flexible and can fit around vents, wires, and wall bracing. Fiberglass insulation is an irritant to the skin, eyes, and lungs. Be sure to protect yourself prior to installation, using a respirator rather than a dust mask, eye covering, long gloves and sleeves, and pants.